I am unsubscribing because I am no longer doing much cooking. I have thoroughly enjoyed your website, and the recipes. Thank you so much. Jean C.
I look forward to learning from you again on a regular basis. I hope you are well. I had subscribed to your blog some weeks ago but never received emails saying there was a new blog posting…. when I saw you have a brand new blog I wasn’t sure my previous subscription request would transfer so I’ve subscribed again! Beautiful new blog. Welcome. Look forward to more recipes and classes. Loved your class last night on Mardi Gras foods and look forward to getting your blog. I am looking forward to this subscription! Thanks! Hope you’ll enjoy the posts on Paris and the others too! Have just pulled your Sunday Soup book out – ( just starting to think of soup again in the southern hemisphere) and was reminded, as I flicked through its pages, of how much I have enjoyed your recipes. Although slightly different terminology at times, most things are available. Haven’t made a dud yet! Thanks very much from Auckland. Love your ideas about food/life. Just noticed, though, that when I tried to copy a recipe into Word to print it, your green background becomes the background for the recipe and I couldn’t figure out how to make it white. At this rate, I’ll be using up quite a few color cartridges! No doubt it’ll be worth it, but perhaps there’s some other way to print the recipes out from your site? Hi Sandra, I believe your problem with printing the recipes is a technical one that I can’t solve. However, your comment prompted me to ask my web designer to insert a “print” button that will make it easier for you to print my posts. It will be up and running in the near feature! Just discovered your website Betty, I have your cookbooks and have been making recipes from them for years! Congrats on the blog & web site! One of my all time favorites and most requested for me to bring to Thanksgiving & Christmas dinners are your Bourbon Carrots, now affectionately known as “Aunt Suzi’s bourbon carrots! I always give credit to your cookbook though! Happy Holidays to you and yours, thanks for all the fantastic food! Thanks so much for your nice note. I love those bourbon carrots too and was so pleased to hear that they’re a family favorite. Happy Thanksgiving to you! And, thank you for such a nice note. I hope you’ll enjoy the recipes on my blog My philosophy is the same as when I wrote the column–I try to create recipes that have a little twist but are still easy to make and filled with flavor! Thanks so much for your note and for signing up for my blog. I’m glad you had a chance to check out my Paris page. How special that you are returning to Paris after such a long time. Although we (my husband and moi) come for long visits and rent an apt, I do have a few places I could recommend. Hotel des St Peres-rue des St Peres Friends of ours just stayed here and really were pleased, but the rooms are very small. Betty, We met several years ago in Columbus, OH at your Cooking School and Columbus Trust Company. Remembering when you visited there with your mother about 1979-80. My husband and I moved shortly after. Have been cooking from your first cookbook for years and have now discovered your website and just ordered your latest cookbook! What fun. I always make one of your recipes when we meet new friends as they then think I am GREAT. Also, for last 10 years we have become visitors of different areas of France. More Later. Thanks so much for your note. 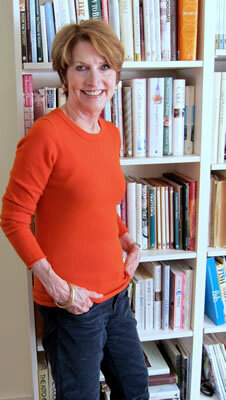 So pleased you subscribed to my blog and hope you’ll enjoy the stories and the recipes. I’m always so thrilled to hear that readers are cooking from my books. The new Sunday Casseroles has some great recipes for sharing with friends. Hope you’ll enjoy them! They’re easy to make! Carole, Thanks so much for your note. I was thrilled with the article and was reminded of how special student like you were. Hope your family is well. I’m working on a new soup book and hope to be in Columbus with it in fall of 2016! I can’t tell you how much I was touched by your note. Every teacher (especially those of us who teach cooking) loves to hear that students use and enjoy the recipes that have been taught. It sounds like you have a wonderful dinner group and that food is the bond you all share. Please do stay in touch with me, especially via my blog. I post recipes about every week or 10 days and also write about my food travels. Please give my best to all of the members of your dining group! I love Betty and have nearly all her cookbooks. Her recipes are always easy to make and really, really good. I unsubscribed to the blog because I just didn’t find the content useful enough. I always want something to do and the blog didn’t give me enough of that. But…I will still buy Betty’s cookbooks! You’re always welcome to subscribe again! Thanks for your note.